Paulette provides two hour couples coaching sessions as well as 1:1 consultations. "Paulette, thank you for helping me deal with many challenges in my life. Your calm, balanced, sensitive approach has helped me with my marriage, parenting, friendships, decisions and just LIFE." Testimonials: ﻿The ongoing support Paulette provides following the training really made the difference for me. Having the process modeled by Paulette and through the many activities she took us through, I gained skills and confidence that could not be achieved from the initial two day training. I highly recommend these sessions. "When I remember Paulettte taking me through the process, I feel empowered and optimistic that I might use NVC on a regular basis." Jeremy L. Gold Coast Queensland. Ongoing support is provided for graduates of Foundation Trainings to assist with integrating NVC skills into daily life. This supported practice is invaluable for helping develop confidence and fluency in using the process. 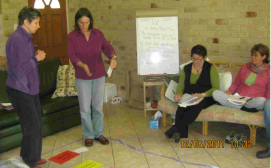 Sessions are held weekly on alternate Wednesdays and Fridays, 10am-midday and Tuesday evenings 6-8pm. "Paulette is wonderfully effective in reaching out and into many of us. Awakening our awareness of our emotional states of selves and others, calling us there to connect deeply." "I take time out to go to the group sessions because using the NVC teachings help me understand giving empathy and compassion in my daily life which helps me give meaning, understanding and direction to my personal growth." E W - Activist. Find understanding, clarity and a way forward, regardless of the issue. Don't let conflict fester - call Paulette today. To support you on your journey for Certification and / or simply to assist your integration of NVC into your daily life, Paulette provides Extended Learning Formats of 6 months, one year and two years duration. Over this time ELF participants receive access to discounted Foundation and Advanced Trainings, individual and group Coaching, telephone support and much more. Contact Paulette for more information. The support and trainings I received with the Extended Learning Format over one year really helped me to make NVC part of my life. I was able to get help for my own personal challenges in mastering NVC and this made an enormous difference. The Foundation Training was a great introduction, but I could not have integrated NVC into my life so fully without the ongoing support. What's more the discounts in doing the ELF made it all the more affordable.